Join us for a good glass of wine from our cellar and learn a bit about us and our home. For many years now we have been interested in and involved with wine, holidays, people seeking relaxation, farming, animals, ecology, tourism, humanity, plants...in other words - in life. And so we have slowly developed our own viewpoint on how to run a farm and we have dedicated ourselves to realizing this dream. Not all of our ideas have worked out and some have required more time than we anticipated. Our newest "off-spring" is our own vineyard and wine production. But we are also continuously developing new ideas for our holiday apartments. We have just completed some renovations of the main house, including new insulation, a coat of paint and a new railing around the balcony. Our guests come to feel very much at home here and find it hard to depart. Especially the children become quite attached to our animals and would often like nothing better than to take one home with them. Come and get to know us! Maybe you will fall in love with this part of the world called Kaltern. 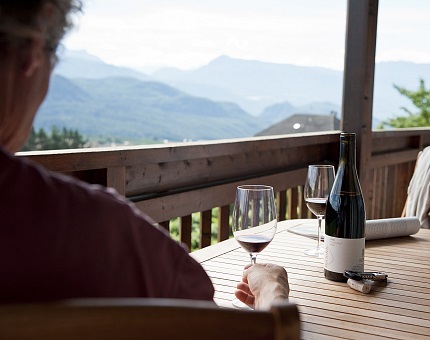 Relax and enjoy the best days of the year at the Organic Vineyard Tröpfltalhof.